A friend put it succinctly when she said that she was itching to shed "the bourbon and blanket lifestyle" we've all adopted (whether in real life or just psychologically) in order to cope with a record-setting wet, cold spring. For me this means not only switching my wardrobe to t-shirts and sandals, but putting away the soup pots and starting to think outside the Dutch oven. And what are the shorts and sandals of the table but hearty salads made with the fresh greens spilling off of farmers' market tables and popping out of raised beds. The Italian parsley I planted last year has come back with a vengeance, and the mint I dug up, potted and shared with the neighbors is happily doing what it does best and spreading all over the place once again. 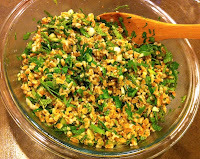 And because I was moved to buy some farro recently, I decided to see what it would be like in a tabbouleh-type of salad. Tossed with some spring onions and garlic and tossed with a lemony vinaigrette, it's a great side dish as is, but would be great with chopped tomatoes and cucumbers when they come along, and the addition of fresh slices of mozzarella alongside would make a nice lunch. For summer barbecues it'll be a perfect light grain dish to go with whole roasted chicken hot off the Weber. OK, weather, I'm ready for summer now. Bring it on! To make the vinaigrette, take any tightly lidded container (I often use a leftover [clean] salsa container), put all the ingredients into it, put on the lid and shake like the dickens over the sink, in case, as once happened, the lid wasn't as tight as I thought and I ended up dressing the kitchen instead of the salad. Can be made ahead; stores well for several days in the fridge. 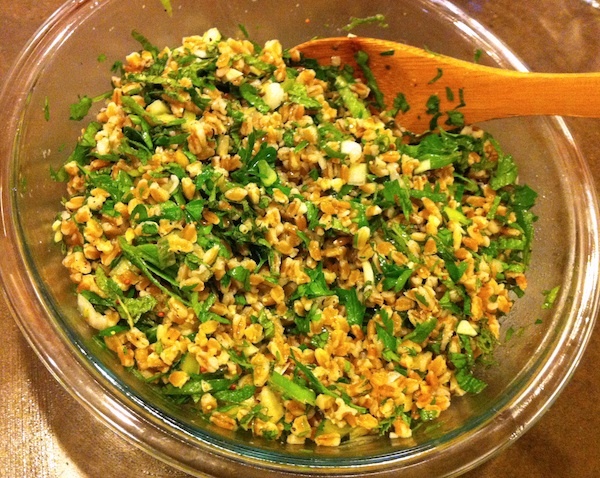 Put 2 cups uncooked farro in the bottom of a large saucepan and cover with 2-3" of water. Bring to a boil, reduce heat to simmer and cook for 20 minutes, adding water if it gets too dry, until farro is cooked through but still has a nice resistance when you bite into it…don't let it get mushy. Drain and rinse in cold water to cool. Transfer to large mixing bowl, add remaining ingredients and enough dressing to moisten. Combine and, if time allows, let it sit for an hour or so for flavors to meld. Serve at room temperature. 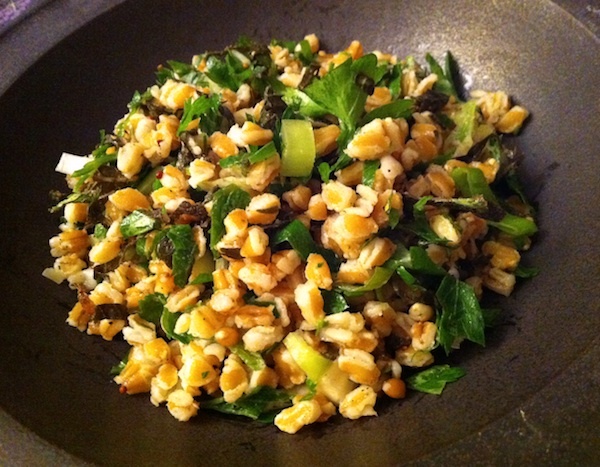 Try this Farro and Pecorino Salad for another take on this great grain! Yum, Kathleen! This looks delicious. Can't wait to try it. And I can't wait to shed the bourbon and blanket lifestyle (as well as the extra pounds) that as you said were necessary to get through this dreary winter/spring (or were put on due the lack of motivation to venture out into the cold.) :) So glad the sun is out today! I can't wait, either…thanks, Carrie!